Welcome to our Personal Development services page. We are unsurpassed in providing personal, educational, business, and organizational training. Our goal is to maximize potential by helping people to, "Stop Tripping and Start Living!" Please see our list of services. Positive and negative stress is a constant influence on all of our lives. The trick is to maximize the positive stress and to minimize the negative stress. This workshop will give participants strategies that will address stressful situations, as well as a toolbox of personal skills, including routines and relaxation techniques. What makes some people more successful than others? Success is not accidental! Successful people did not become successful by chance. Many believe it takes hard work and planning to be successful. But in actuality hard work and planning is only part of it. There are many keys that unlock the secrets to success. Having the keys and knowledge to unlock the secrets are what makes people succeed. If you are ambitious, courageous and have a desire and commitment to unlock the secrets to success, then this seminar is for you! There are numerous causes for tripping including fear and sudden changes in our lives. A major reason people trip is when they feel unsure about their circumstances and challenges. Learn what's stopping you from reaching your full potential! Discover how you create unconscious self-handicapping attitudes that constrain your potential. Stop Tripping and start living helps people obtain emotional, physical, and spiritual balance. Experiencing this balance or wholeness is essential for self-actualization. This presentation will teach strategies and techniques that reduce stress, self-handicapping behaviors and to attract the things in life that you deserve and desire. 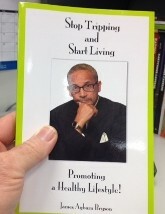 The Stop Tripping and Start Living: Promoting Healthy Lifestyle book compliments presentations, but can also be purchased separately to add to your collection of reading pleasure. Please contact us to order your copy. Over half of marriages end in divorce and domestic violence is epidemic, Relationships are in crisis, As men and women continue to change their roles in society, walls grow taller, wider and deeper resulting in disappointment. This workshop attempts to examine some of the issues that are building walls of destruction between people. Participants will be entertained and educated while tearing down the walls of myths, stereotypes, and misconceptions pertaining to love, marriage and relationships. Our lively activities and discussions will empower you and provide a solid foundation for personal and emotional growth. Please contact us to schedule one or a series of our exciting customized seminars.